Earlier today, as part of its daily (weekdays) book review slot on the Nine to Noon programme, Radio New Zealand took a look at the latest novel in British crime writer Mark Billingham's award-winning Tom Thorne series, FROM THE DEAD. One of the great things about the Nine to Noon show, hosted by Kathryn Ryan - who also regularly does interviews with New Zealand and visiting authors - is that they do semi-regularly cover some crime and thriller titles. They can also be fascinating reviews to listen to, because rather than being just a print review of a reviewer's thoughts, Ryan 'interviews' the reviewer, and asks them questions about the book, drawing out comments. So it's more of a dialogue, than a monologue - which is a nice change of pace. Today the reviewer was the always-excellent Graham "Bookman" Beattie, who is (deservedly) very highly regarded in the New Zealand book industry. He is the former head of Penguin Books, a Book Awards judge, a Books Editor, and is now an acclaimed blogger and consultant to the industry. He is also one of the seven judges for the inaugural Ngaio Marsh Award for Best Crime Novel - the winner of which will now be announced later this year. 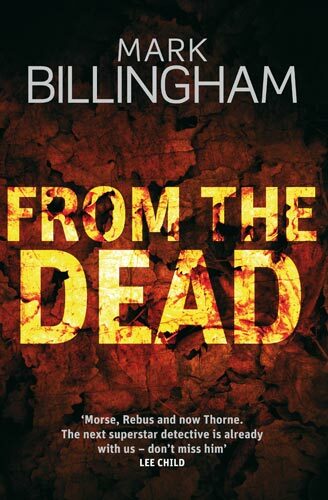 Beattie describes FROM THE DEAD, Billingham's tenth crime novel, and ninth to feature "likeable but quite complex" Tom Thorne, as "gripping stuff" that "moves along at a real clip" Beattie says he was "so captured was I that I read it in three long sittings over the last couple of days". You can listen to the full audio file of Beattie's review of FROM THE DEAD here. You can also read a print version of Beattie's thoughts about FROM THE DEAD (including further comments) here. And for those who need further tempting to try this very good crime thriller (I read it myself several weeks ago), you can read the first chapter online at Billingham's website here. Billingham has been one of my favourite British crime writers for a long time, and I heartily recommend any crime fiction fan giving his Tom Thorne series a go - especially readers who don't mind playing down the grittier end of the crime fiction spectrum. Have you read any of Mark Billingham's books? Are you a fan of his Tom Thorne tales? What do you think of the Bookman's review? Does FROM THE DEAD sound like a crime thriller you'd like to read? Thoughts and comments welcome. The first Billingham book I read was Death Mesage, which was very good. Then, In The Dark and Bloodlines which were amazingly good. So, From The Dead looks like another one for me!